In its April 2018 cybersecurity newsletter, OCR draws attention to the benefits of performing a gap analysis in addition to a risk analysis. 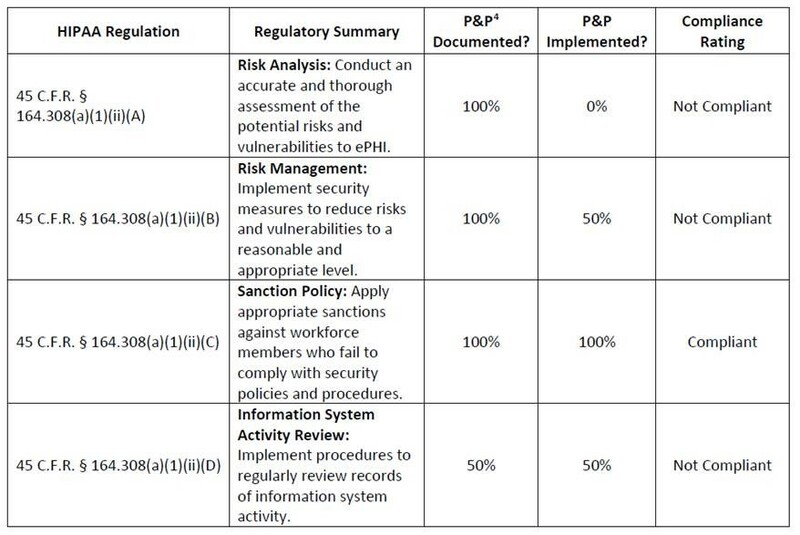 The latter is required to identify risks and vulnerabilities that could potentially be exploited to gain access to ePHI, while a gap analysis helps healthcare organizations and their business associates determine the extent to which an entity is compliant with specific elements of the HIPAA Security Rule. HIPAA requires covered entities and their business associates to perform a comprehensive, organization-wide risk analysis to identify all potential risks to the confidentiality, integrity, and availability of ePHI – 45 CFR § 164.308(a)(1)(ii)(A). If a risk analysis is not performed, healthcare organizations cannot be certain that all potential vulnerabilities have been identified. Vulnerabilities would likely remain that could be exploited by threat actors to gain access to ePHI. A comprehensive assessment of all risks to all ePHI, regardless of where the data is created, received, maintained, or transmitted, or the source or location of ePHI. All locations and information systems where ePHI is created, received, maintained, or transmitted must be included in the risk analysis, so an inventory should be created that includes all applications, mobile devices, communications equipment, electronic media, networks, and physical locations in addition to workstations, servers, and EHRs. The risk analysis should cover technical and non-technical vulnerabilities, the latter includes policies and procedures, with the former concerned with software flaws, weaknesses in IT systems, and misconfigured information systems and security solutions. The effectiveness of current controls must be assessed and documented, including all security solutions such as AV software, endpoint protection systems, encryption software, and the implementation of patch management processes. The likelihood that a specific threat will exploit a vulnerability and the impact should a vulnerability be exploited must be assessed and documented. The level of risk should be determined for any specific threat or vulnerability. With a risk level assigned, it will be easier to determine the main priorities when mitigating risks through the risk management process. The risk analysis must be documented in sufficient detail to demonstrate that a comprehensive, organization-wide risk analysis has been conducted, and that the risk analysis was accurate and covered all locations, devices, applications, policies, and procedures involving ePHI. OCR will request this documentation in the event of an investigation or compliance audit. A risk analysis is not a one-time event to ensure compliance with the HIPAA Security Rule – It must part of an ongoing process for continued compliance. The process must be regularly reviewed and updated, and risk analyses should be performed regularly. HIPAA does not stipulate how frequently a full or partial risk analysis should be performed. OCR suggests risk analyses are most effective when integrated into business processes. Once a risk analysis has been performed, all risks and vulnerabilities identified must be addressed through a HIPAA-compliant security risk management process – 45 CFR § 164.308(a)(1)(ii)(B) – to reduce those risks to a reasonable and appropriate level. A gap analysis is not a requirement of HIPAA Rules, although it can help healthcare organizations confirm that the requirements of the HIPAA Security Rule have been satisfied. A gap analysis can be used as a partial assessment of an organizations compliance efforts or could cover all provisions of the HIPAA Security Rule. Several gap analyses could be performed, each assessing a different set of standards and implementation specifications of the HIPAA Security Rule. The gap analysis can give HIPAA-covered entities and their business associates an overall view of their compliance efforts, can help them discover areas where they are yet compliant with HIPAA Rules, and identify any gaps in the controls that have already been implemented. Note that a gap analysis is not equivalent to a risk analysis, as it does not cover all possible risk to the confidentiality, integrity, and availability of ePHI as required by 45 C.F.R. §164.308(a)(1)(ii)(A). The post OCR Encourages Healthcare Organizations to Conduct a Gap Analysis appeared first on HIPAA Journal. One of the biggest data security challenges is how to defend against insider threats in healthcare. Insiders are responsible for more healthcare data breaches than hackers, making the industry unique. Verizon’s Protected Health Information Data Breach Report highlights the extent of the problem. The report shows 58% of all healthcare data breaches and security incidents are the result of insiders. Healthcare organizations also struggle to detect insider breaches, with many breaches going undetected for months or even years. One healthcare employee at a Massachusetts hospital was discovered to have been accessing healthcare records without authorization for 14 years before the privacy violations were detected, during which time the records of more than 1,000 patients had been viewed. Healthcare organizations must not only take steps to reduce the potential for insider breaches, they should also implement technological solutions, policies, and procedures that allow breaches to be detected rapidly when they do occur. Before explaining how healthcare organizations can protected against insider threats, it is worthwhile covering the main insider threats in healthcare. An insider threat is one that comes from within an organization. That means an individual who has authorization to access healthcare resources, which includes EMRs, healthcare networks, email accounts, or documents containing PHI. Resources can be accessed with malicious intent, but oftentimes mistakes are made that can equally result in harm being caused to the organization, its employees, or its patients. Insider threats are not limited to employees. Any individual who is given access to networks, email accounts, or sensitive information in order to complete certain tasks could deliberately or accidentally take actions that could negatively affect an organization. That includes business associates, subcontractors of business associates, researchers, volunteers, and former employees. The consequences of insider breaches can be severe. Healthcare organizations can receive heavy fines for breaches of HIPAA Rules and violations of patient privacy, insider breaches can damage an organization’s reputation, cause a loss of patient confidence, and leave organizations open to lawsuits. According to the CERT Insider Threat Center, insider breaches are twice as costly and damaging as external threats. To make matters worse, 75% of insider threats go unnoticed. Insider threats in healthcare can be split into two main categories based on the intentions of the insider: Malicious and non-malicious. Malicious insider threats in healthcare are those which involve deliberate attempts to cause harm, either to the organization, employees, patients, or other individuals. These include the theft of protected health information such as social security numbers/personal information for identity theft and fraud, the theft of data to take to new employers, theft of intellectual property, and sabotage. Research by Verizon indicates 48% of insider breaches are conducted for financial gain, and with healthcare data fetching a high price on the black market, employees can easily be tempted to steal data. A 2018 Accenture survey conducted on healthcare employees revealed one in five would be prepared to access and sell confidential data if the price was right. 18% of the 912 employees surveyed said they would steal data for between $500 and $1,000. Alarmingly, the survey revealed that almost a quarter (24%) of surveyed healthcare employees knew of someone who had stolen data or sold their login credentials to an unauthorized outsider. Disgruntled employees may attempt to sabotage IT systems or steal and hold data in case they are terminated. However, not all acts of sabotage are directed against employers. One notable example comes from Texas, where a healthcare worker used hospital devices to create a botnet that was used to attack a hacking group. The Breach Barometer reports from Protenus/databreaches.net break down monthly data breaches by breach cause, including the number of breaches caused by insiders. All too often, insiders are responsible for more breaches than outsiders. Snooping on medical records is all too common. When a celebrity is admitted to hospital, employees may be tempted to sneak a look at their medical records, or those of friends, family members, and ex-partners. The motivations of the employees are diverse. The Verizon report suggests 31% of insider breaches were employees accessing records out of curiosity, and a further 10% were because employees simply had access to patient records. Other non-malicious threats include the accidental loss/disclosure of sensitive information, such as disclosing sensitive patient information to others, sharing login credentials, writing down login credentials, or responding to phishing messages. The largest healthcare data breach in history – the theft of 78 million healthcare records from Anthem Inc.- is believed to have been made possible because of stolen credentials. The failure to ensure PHI is emailed to the correct recipient, the misdirection of fax messages, or leaving portable electronic devices containing ePHI unattended causes many breaches each year. The Department of Health and Human Services’ Office for Civil Rights’ breach portal or ‘Wall of Shame’ is littered with incidents involving laptops, portable hard drives, smartphones, and zip drives that have stolen after being left unattended. The standard approach to mitigating insider threats can be broken down into four stages: Educate, Deter, Detect, and Investigate. Educate: The workforce must be educated on allowable uses and disclosures of PHI, the risk associated with certain behaviors, patient privacy, and data security. Deter: Policies must be developed to reduce risk and those policies enforced. The repercussions of HIPAA violations and privacy breaches should be clearly explained to employees. Detect: Healthcare organizations should implement technological solutions that allow them to detect breaches rapidly and access logs should be regularly checked. Investigate: When potential privacy and security breaches are detected they must be investigated promptly to limit the harm caused. When the cause of the breach is determined, steps should be taken to prevent a recurrence. It should be standard practice to conduct a background check before any individual is employed. Checks should include contacting previous employers, Google searches, and a check of a potential employee’s social media accounts. All healthcare employees should be made aware of their responsibilities under HIPAA. Training should be provided as soon as possible, and ideally before network or PHI access is provided. Employees should be trained on HIPAA Privacy and Security Rules and informed of the consequences of violations, including loss of employment, possible fines, and potential criminal penalties for HIPAA violations. Phishing is the number one cause of data breaches. Healthcare employees are targeted as it is far easier to gain access to healthcare data if an employee provides login credentials than attempting to find software vulnerabilities to exploit. Strong anti-phishing defenses will prevent the majority of phishing emails from reaching inboxes. Advanced spam filtering software is now essential. Since no technological solution will prevent all phishing emails from reaching inboxes, it is essential – from a security and compliance perspective – to teach employees the necessary skills that will allow them to identify phishing attempts and other email/web-based threats. Employees cannot be expected to know what actions place data and networks at risk. These must be explained if organizations want to eradicate risky behavior. Security awareness training should also be assessed. Phishing simulation exercises can help to reinforce training and identify areas of weakness that can be tackled with further training. Employees are often best placed to identify potential threats, such as changes in the behavior of co-workers. Employees should be encouraged to report potentially suspicious behavior and violations of HIPAA Rules. While Edward Snowden did not work in healthcare, his actions illustrate this well. The NSA breach could have been avoided if his requests for co-workers’ credentials were reported. The fewer privileges employees have, the easier it is to prevent insider breaches in healthcare. Limiting data access to the minimum necessary amount will limit the harm caused in the event of a breach. You should be implementing the principle of least privilege. Give employees access to the least amount of data as possible. This will limit the data that can be viewed or stolen by employees or hackers that manage to obtain login credentials. Portable electronic devices can easily be stolen, but the theft of a device need not result in the exposure of PHI. If full disk encryption is used, the theft of the device would not be a reportable incident and patients’ privacy would be protected. Employees can be told to use strong passwords or long passphrases, but unless password policies are enforced, there will always be one employee that chooses to ignore those policies and set a weak password. You should ensure that commonly used passwords and weak passwords cannot be set. Two-factor authentication requires the use of a password for account access along with a security token. These controls prevent unauthorized access by outsiders, as well as limiting the potential for an employee to use another employee’s credentials. You should have a policy in place that requires logins to be deleted when an employee is terminated, a contract is completed, or employees leave to work for another organization. There have been many data breaches caused by delays in deleting data access rights. Data access should not be possible from the second an employee walks out the door for the last time. If employees require access to sensitive data for work purposes it can be difficult to differentiate between legitimate data access and harmful actions. HIPAA requires PHI access logs to be maintained and regularly checked. Since this is a labor-intensive task, it is often conducted far too infrequently. The easiest way to ensure inappropriate accessing of medical records is detected quickly is to implement action monitoring software and other software tools that can detect anomalies in user activity and suspicious changes in data access patterns. The post How to Defend Against Insider Threats in Healthcare appeared first on HIPAA Journal. The post Former Berkeley Medical Center Worker Gets 5 Years’ Probation for Identity Theft appeared first on HIPAA Journal. The post Verizon PHI Breach Report Confirms Healthcare Has Major Problem with Insider Breaches appeared first on HIPAA Journal. Under HIPAA, protected health information is considered to be individually identifiable information relating to the health status of an individual, the provision of healthcare, or individually identifiable information that is created, collected, or transmitted by a HIPAA-covered entity in relation to payment for healthcare services. PHI only relates to information on patients or health plan members. It does not include information contained in educational and employment records. PHI is any health information that includes the following 18 identifiers. If these identifiers are removed the information is considered de-identified protected health information, which is not subject to HIPAA Rules. How Must Health Information be Protected? HIPAA requires physical, technical, and administrative safeguards to be implemented. Technologies such as encryption software and firewalls are covered under technical safeguards. Physical safeguards include keeping physical records and electronic devices containing PHI under lock and key. Administrative safeguards include access controls to limit who has access to PHI and security awareness training. The post What is Considered Protected Health Information Under HIPAA? appeared first on HIPAA Journal. A third-party HIPAA compliance solution provider can provide ongoing assistance with your HIPAA compliance program including helping you conduct risk analyses, provide staff training, conduct internal audits, and perform documentation checks. The post How to Become HIPAA Compliant appeared first on HIPAA Journal. The post South Dakota Enacts Data Breach Notification Law as Congress Considers Federal Breach Notice Bill appeared first on HIPAA Journal. A researcher at Vanderbilt University has conducted a study that suggests mortality rates at hospitals increase following a data breach as a result of a drop in the standard of care. The researcher estimates healthcare data breaches may cause as many as 2,100 deaths a year in the United States. The study was conducted by Owen Graduate School of Management researcher, Dr. Sung Choi. The findings of the study were presented at a recent cyberrisk quantification conference at Philadelphia’s Drexel University LeBow College of Business. Cyberattacks can have a direct impact on patient care, which has been clearly highlighted on numerous occasions over the past 12 months. Ransomware and wiper malware attacks have crippled information systems and have forced healthcare providers to cancel appointments, while the lack of access to patient health records can cause treatment delays. Notable attacks that caused major disruption were the NotPetya wiper and WannaCry ransomware attacks last year, with the latter causing major problems for the National Health Service in the UK. Choi explained that data breaches can be a distraction for physicians and the after affects of breaches can last for years. HIPAA covered entities face investigations and litigation which Choi suggests could result in disruption to medical services and delays in providing treatment. The cost of mitigating attacks, including purchasing additional security solutions and dealing with the fallout from data breaches can see resources diverted away from patient care. For the study, Choi compared mortality rates at hospitals before and immediately after a data breach had occurred. One of the metrics used to assess a potential fall in the quality of care was the percentage of heart attack patients who died within 30 days of admission to hospital. Choi notes that the control group and breached hospitals had similar mortality rates, although after a data breach, the mortality rate for the control group remained the same but increased at hospitals that had experienced a breach. Choi’s analysis showed there was a 0.23% increase in the mortality rate one year following a data breach and an increase of 0.36% two years after a breach. That equates to 2,160 deaths a year. Choi also noted that the time taken to administer electrocardiographs was longer for newly admitted patients after a hospital had experienced a data breach. The study was presented just a few days before the Department of Health and Human Services’ Office for Civil Rights issued a reminder to HIPAA covered entities about the need to develop contingency plans for emergencies such as cyberattacks and ransomware incidents. OCR explained that HIPAA Rules on contingency planning help to ensure a fast recovery from a natural disaster, cyberattack, or other emergency situation. This research suggests that the development of an effective contingency plan and a rapid response to data breaches can save lives. The post Research Suggests Healthcare Data Breaches Cause 2,100 Deaths a Year appeared first on HIPAA Journal. The post HIPAA Rules on Contingency Planning appeared first on HIPAA Journal.